I wonder how different things would be if the standing press were as popular as the bench press? I suspect there would be many more strong folks walking around. Here’s the great Doug Hepburn pressing 425 pounds from a rack – that’s more than most people can squat! One thing’s for sure, increase your press and you’ll get a whole lot stronger everywhere else too. “I’ve got more strength in one finger than you have in your whole body!” For most people, such a statement would be mere hyperbole, but in the case of Doug Hepburn it was obviously true. One of Doug Hepburn’s favorite feats was to muscle out a 45-pound plate hanging from his pinky finger — an amazing display of shoulder and grip strength. As evident here, Hepburn could do this with either hand. Hand Balancing was part of Doug Hepburn’s regular training program. He figured the the increased blood flow to the upper body while in the inverted position would be good for building his pressing strength. Given his track records, there certainly may be something to that. Here’s Doug as the ‘bottom man’ in a unique feat: that’s a 205 pound barbell and a 170 pound man he’s holding overhead. This picture is more impressive than it may appear when you consider how they got in that position in the first place – a feat in itself. This picture was taken just after Doug established a new world record in the press with a lift of 353 pounds. 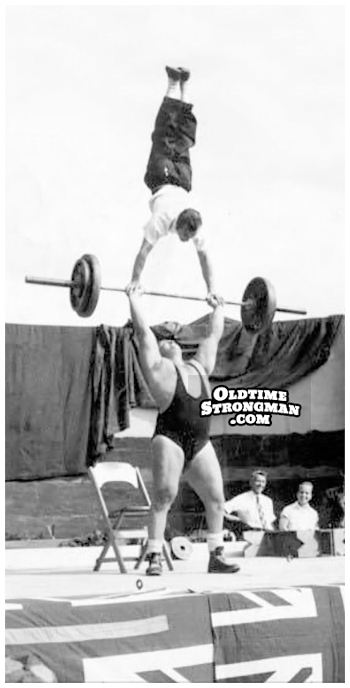 A shot of a young Doug Hepburn performing what amounts to a “muscle out” with a friend performing a handstand on his outstretched arms. This picture was taken around 1950, then, and for a few years prior, Doug was a lifeguard at Vancouver’s famous Kitsilano beach. Doug took take a weight set with him and trained right on the sand — this was one of the most productive periods of his life. December 30th, 1958 was the date when Doug Hepburn backlifted six members of the Vancouver Canucks hockey team just for kicks. The weight was estimated at 1500 pounds which makes this a pretty easy one as far as backlifts go.